Sample tweet: "Just had amazing interview w microbiologist Glenn Gibson  he makes fake gut models in his lab! 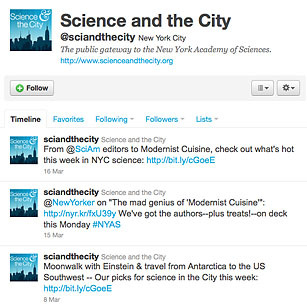 New Scientist article: http://bit.ly/bgOvgg"
The New York Academy of Sciences Twitter feed is like the culture listings in a newspaper: find lecture series, documentary screenings, panels and exhibits in just about any scientific discipline imaginable. Even if you're not in New York City, you can still enjoy links to interviews with leading researchers in everything from genetics to paleontology to nuclear physics.